We just completed a 5 1/2 week, 5,000 mile, trip and saw only one other PC. We went from California to Kentucky and back. Finally saw a PC arrive in a campground on the Mississippi near Memphis. Didn't go over that afternoon as we were in the middle of a tornado watch and preparing to abandon our PC! The next morning I stopped by and met the owner, they had just picked up their new PC and were headed home to Oklahoma. He had great things to say about the folks at the factory and I encouraged him to join the forum and share his experience and see the great info from other PC owners. Just frustrating that I didn't many PCs, guess it is a big country. Re: Where are all the Phoenix Cruisers? Funny you mention that. We went from PA to Utah this summer. Saw one other PC and that was in western PA.
Every trip we've taken, the most I've seen is 2, one going in the opposite direction on the interstate. I've noticed the same, but assume it's because relative to many (most?) other manufacturers, PC produces fewer units. The roads are simply populated by more mass manufactured brands. Sightings were much worse with our first motor home of 24 years. The Mirage company built 5 per week during their best times. In all our travels, we seen maybe 6 since 1983. Someone local to me had owned one for many years of which I seen maybe once a year, but I don't count him in my sightings. Funny that the Mirage was built not far from PC-USA. How may of you have seen a Mirage, made 1978-1986? The Phoenix Cruiser is much more popular than our Mirage ever was. 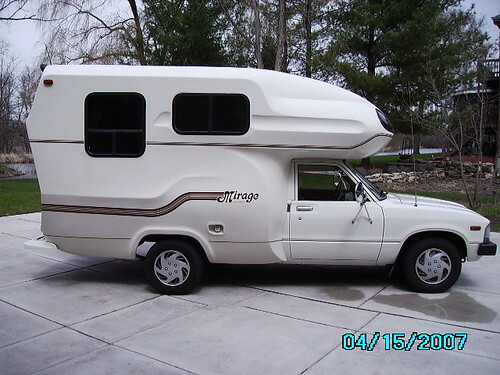 If the Mirage was, as it appears, one of the many minimotorhomes based on the Toyota pickup chassis, there's a reason why you don't see many. They were notorious for breaking their rear axles because of being overloaded. Really cute, but not brawny enough for an RV. You are absolutely correct about the rear axle. The dual wheels were fake, actually worse than rigs equipped with single rear wheels. Using custom fabricated wheels, the inside of the outer wheel bolted to the outside of the inner wheel. That inner wheel bolted conventionally to the axle hub using just the typical 5 lug pattern. It was rediculous. Our saving grace was that the Mirage weighed only 3600 pounds plus people & supplies. It was a very light weight rig. The rear axle never failed us. But self contained motor homes like the Dolphin, Winnebago Warrier, and the kind with full blown motor home features, they were in danger while still on the factory floor. Those goofy rear axled motor homes were manufactured through 1987. In 1988 Toyota introduced true dual wheels paired with an appropriate heavy duty axle very similar to conventional motor homes. The problem went away, but the reputation stuck like glue. For our 1983 Mirage, I replaced the rear duals with large single rear tire around 1986/87. After a number of years dealing with handling troubles, in 1995 I finally took the rig to a place who educated me on the free axle upgrade from Toyota. 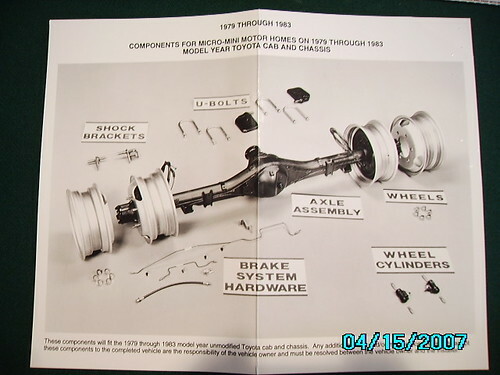 They provided a brand new 1995 rear axle assembly seen below, and me the labor. I had to sign a waiver stating I would never sue Toyota over this. When finished the rig was solid and performed great til the day I sold it. Here is what Toyota provided free including shipping to the shop of my choice. Here is the upgrade in 2007 when I sold the rig, a very conventional design, the right solution to a huge problem. 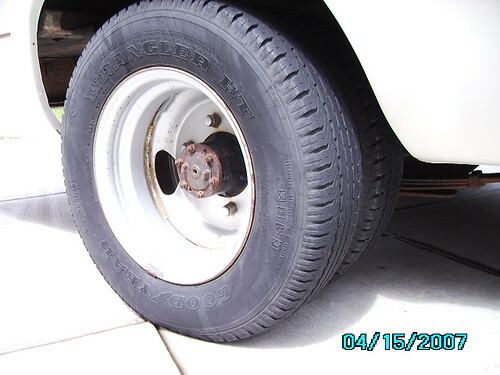 I found an internet picture of fake rear wheels. It isn't very clear, but look close. This set appears to have a 6 bolt pattern but my 1983 had 5. We just completed an RV caravan down the Great River Road: from southern Ohio to Bemidji, Minnesota to New Orleans, back to Ohio via the Natchez Trace, 3600 miles. Didn’t see another PC. However, one campground owner, seeing all of the caravan RVs parked in a row, said “You’ve got the best rig here.” Pic on the Natchez Trace attached. We hit the road for a couple of days just to get away with our first stop in St. Augustine and then we decided to go to Ocala to our favorite spot "Silver River State Park" .... but as we were getting off I-95 we passed a gas station and my husband noticed a Phoenix Cruiser .... so we wipped in the station going the wrong way but we were so excited to see another one of us. We pulled up next to their unit and the lady was getting out with her little pups to walk and I put the window down and commented on how beautiful her RV was .... she smiled and then looked at ours to see that we had the same one. They have owned their PC about as long as us and are getting use to downsizing and of course we are trying to get use to going up .... I felt like a giddy little school girl so excited .... but .... I forgot to introduce ourselves or find out who they were. Day two of our small adventure. We left Ocala Florida heading for Jackson Georgia .... we jumped on I-75 and low and behold a few miles up the road we saw another Phoenix Cruiser .... yes ... The second PC sighting in two days .... the people were most likely wondering what rock we crawled out from under ... passing them, tooting the horn and smiling & waving . It was certainly a beautiful rig !! We have never been to Silver River State Park. I checked it out in the Florida State Park Brochure. Looks good. We are thinking of trying for Feb.
We have been to Silver River State Park a couple of times. We always got a pull thru site. I don't think thy have a bad site there. Leaving in 41 days but who is counting!!!! Love Silver River State Park .... and Sue is right when she said they don't have any bad sites. You are not parked in dirt ... the sites are asphalt or small crushed stone and spaced out and treed nicely for privacy and you are not on top of the next guy ... it is so clean the facilities are spotless. They have a very interesting museum. They have walking trails down to the springs, boat rentals, bike paths, cabins .... just a really neat clean place. We never get tired of going there. ps .... had another Phoenix Cruiser sighting today in Vero Beach, FL .... three in four days time ... we are getting over run with Phoenix cruisers !! Wow, that's a lot compared to the one we saw over a 5 1/2 week trip from California to Kentucky and back. We will be on the look out during our two month trip to Arizona this winter.